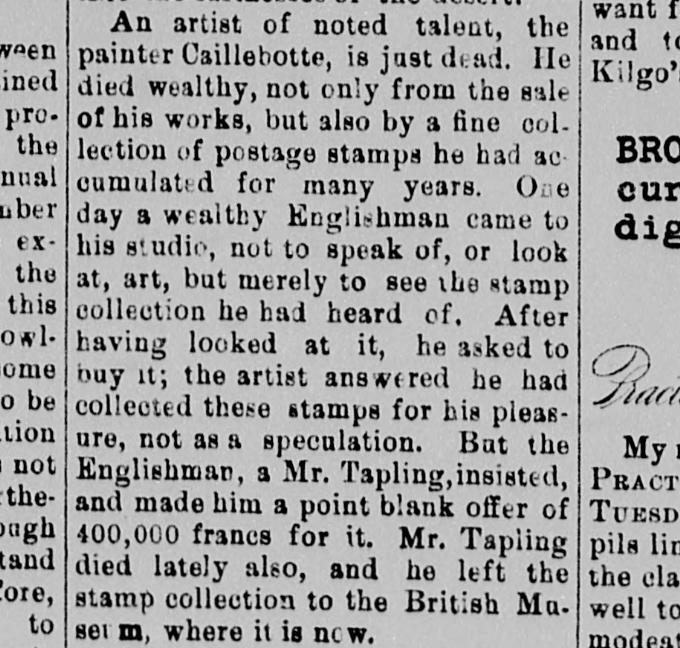 Gustave Caillebotte was a 3rd cousin to Paul de Launay (my grandfather) and Paul Valpinçon. The latter two (the two Pauls) were 2nd cousins to each other. Paul Valpinçon was the lifelong friend of Edgar Degas mentioned in the art history books, and it was through Valpinçon whom Degas was introduced to Caillebotte, and through whom the two met Ingres….and thus began the era of French Impressionism. 178 km west of Paris, on a vast and grand French estate in Normandie which remained in our family for 152 years, next to the Chateau there is an art studio that my cousin, Paul Valpinçon, built for his lifelong dear friend, Edgar Degas. It was built with a large window so that Degas could paint during inclement weather. This was the vast estate of the Valpinçon family chateau (French castle), and originally spanned over 250 acres. The property was originally purchased by René Valpinçon (Paul de Launay’s grand uncle), in 1822, and it remained in our family until 1974. The current owner was very instrumental in having the estate designated a French historical landmark just a few years ago. Paul de Launay’s paternal grandmother was Marie Valpinçon, sister of René Valpinçon. Today this estate is about half of its original size, as each time it is sold, French law allows farmers to buy the acreage they are renting to farm. Other physical changes are a water fountain in the front of the main house, and a metal Russian coat of arms of a recent owner is now bolted over the original Valpinçon coat of arms which are over both the back and main entrances. Both Paul & Marguerite Valpinçon died on the estate, Paul on 13 Oct 1894, and Marguerite on 7 Oct 1898. The chateau passed to Paul Valpinçon’s son Henri, who never married. Although Paul Valpinçon’s daughter, Hortense, was alive and well when Henri died on 28 Oct 1942, the chateau passed to a male cousin, a grandson of Paul Valpinçon’s brother, as was the French custom. Hortense’s only son, Raymond Paul Édouard Fourchy, had already died prematurely on 7 Dec 1937, at the age of 48. Paul Valpinçon, his wife Marguerite, and their children, Henri and Hortense, were all painted and/or drawn by Degas. There are also several paintings of the interior of the chateau by Degas. Degas remained a close friend of the Valpinçon family, especially Hortense until his death on 27 Sep 1917. Renoir painted the “Children of Martial Caillebotte” (Jr. – although not really a Jr., but you may think of him that way), who was one of two younger brothers of Gustave. Caillebotte himself painted his younger brothers, mother, several 1st cousins, and Mlle Boissière (located at the Houston MFA) who was a woman on Alfred’s mother’s side of the family. We can find no record of Adèle Zoé Boissière having a sister, only brothers. Alfred’s mother, Adèle Zoé (neé Boissière) Caillebotte, was my great-grandfather’s 1st cousin, while Martial Caillebotte, the father, was his 2nd cousin by two separate lines. So, Martial (the elder) and his 1st wife, Zoé, were 2nd cousins through their great-grandparents, Thomas Féron (b. 5 Dec 1724, d. 18 May 1799) & Ann Belliot (b. 15 Mar 1724, m. 2 Aug 1742, d. 2 Nov 1799). Their daughter, Anne Julie married Gabriel Pincon de Valpincon, while her brother Francois’ had two daughters, Adeläide and Marie. So in 1793, two Féron daughters, first Marie in January, and then Adeläide in October, married two Caillebotte brothers. One of these brothers, Antoine Marie Pierre Caillebotte, was Gustave’s paternal grandfather. First cousins share the same grandparents, 2nd cousins share the same great-grandparents, 3rd cousins share the same great-great grandparents, and so on. While I have some 1st and 2nd cousins on my fathers side that we rarely communicate with, our family still remains closely connected with our Valpinçon and Caillebotte cousins who are now 4th and 5th cousins. The 1808 painting by Jean Auguste Dominic Ingres, titled “The Valpinçon Bather”“, was a gift of neo-classical painter, Jean Auguste Dominique Ingres to René Valpinçon. Although the woman in the painting is not a Valpinçon family member to our knowledge, the painting was given the Valpinçon family name at some point we have yet to determine, and it stayed in the family until 1879 when it went to the Louvre where it resides today. It was also through the Valpinçon family that both Degas & Caillebotte met their idol, Ingres. Paul Valpinçon and Gustave Caillebotte (along with my grandfather, Paul de Launay) were close cousins who lived just three blocks from each other in Paris, and was the relationship through which Caillebotte also met Edgar Degas, and became involved with the French Impressionist movement. A nephew of René Valpinçon and his sister Marie was Jules Valpinçon, who became the son-in-law of Martin Guillaume Biennais. Biennais was the jeweler who crafted the Crown Jewels for the coronation of Napoleon Bonaparte in 1804, and they are also in the Louvre. This same Jules Valpinçon is also the namesake of my great-grandfather, Jules de Launay (1813-1892), and is listed as godfather on Jules de Launay’s baptismal record (1813), along with Jules’ maternal aunt, Anne (neé Valpinçon) Boissiére. Anne was the mother of Martial Caillebotte’s first wife, Adèle Zoé Boissière. Anne is Paul de Launay’s grand aunt, and she is the sister of René & Marie Valpinçon . Zoé’s son, Alfred Caillebotte, was a Catholic priest and a half-brother of French Impressionist artist Gustave Caillebotte, having different mothers. This makes Anne 1) the grand aunt of Paul Valpinçon (lifelong friend of Degas), 2) the grandmother of Alfred Callebotte (half-brother of Gustave), and 3) 1st cousin of Martial (the father) Caillebotte’s mother, Adelaïde Françoise Féron. Upon the death of Paul de Launay’s father, Dr. Jules de Launay on 27 Mar 1892, Alfred Caillebotte offered to make his sons Paul & Gaston de Launay, both Protestants, the sole heirs to Alfred’s estate if only the boys would be raised in the Catholic Church. Jules’ wife, Annie, refused. Alfred died 17 May 1896. But Paul de Launay became an accomplished artist, sculptor, and organist, even training under one of Gustave’s teachers, Léon Joseph Florentin Bonnat. When the wife of Martin Guillaume Biennais, Madame Biennais died in 1869, her Chateau in Yerres was purchased by Martial Caillebotte (father of Gustave) in a private family auction. Martial’s 2nd cousin, Jules Valpinçon (mentioned above) married one of the Biennais daughters. This property in Yerres is the same property where Gustave Caillebotte painted his first known paintings. So, the sale of this 27 acre estate was literally a sale between cousins. My grandfather, Paul de Launay (1878-1951), was an artist, sculture, and organist trained in Paris, who was also a student of Léon Bonnat. Bonnat was a very famous French artist, and one of Caillebotte’s first teachers. Paul de Launay came to the U.S. in 1903 and became one of the top organists in the country, and a lesser known artist than his famous cousin, but was finally awarded the French Légion d’honneur in 1950, just before his death in 1951. On our Facebook page, linked below, I have posted a photo of Alfred Caillebotte, who was as you may have guessed by now, was both a 3rd cousin AND a half-brother to Gustave. Alfred’s parents were indeed 2nd cousins to each other and were married on 10 May 1828 in Paris. Alfred’s mother was the first wife of Martial Caillebotte, and she died 12 Dec 1836, just four days after their daughter, Leonie (age 6) died. Martial Caillebotte married his 2nd wife, Eugénie Séraphine Lemasquerier, in 1843. She died 12 Jan 1844, 6 days after giving birth to their son, Max, who died the day he was born. Martial’s 3rd wife was Gustave’s mother, Cèleste Daufresne, and they married on 21 Oct 1847. Cèleste was also the niece of the 2nd wife of Martial Caillebotte, but only 5 years younger. All of the wives and children, and some grandchildren, are buried in the Caillebotte Tomb at Pére Lachaise. The Caillebotte, Valpinçon, and de Launay descendants (including 14 known Americans), now 4th, 5th, and 6th cousins, who all maintain very close family ties with each other and still frequently gather as a family in Paris, and Normandie almost annually. The cleaning of a Caillebotte painting at the Chicago Art Institute. The Wives of Martial #Caillebotte, Part 1. This is dedicated to my dear cousins, descendants of Martial Caillebotte. It has long been my belief that the 2nd and third wives of Martial CAILLEBOTTE (the father of Gustave, René, and Martial) were related in some way. As my research continued, I began to suspect that the second wife, Eugénie Séraphine LEMASQUERIER was likely the aunt of the 3rd wife, Cèleste DAUFRESNE, whose mother also born LEMASQUERIER. Special thanks to our cousin, Philippe PINSON de VALPINÇON, for helping me locate family birth and marriage records and proving my beliefs. We knew that Cèleste DAUFRESNE was the mother of Gustave CAILLEBOTTE, René, and Martial. We knew that the mother of Cèleste DAUFRESNE was Marie Cèleste LEMASQUERIER. We now know that Marie Cèleste was born 12 Jul 1797. We now know that Eugénie Séraphine LEMASQUERIER, was born 12 Jul 1813, and was the sister of Marie Cèleste, both having same parents. Finally, we now know that Eugénie Séraphine LEMASQUERIER was also born as a twin, with her brother, Eugene Joseph LEMASQUERIER. I am posting this via an iPhone, and will post more information in the future, as I transcribe these documents. Please forgive any typos I made with my thumbs.